JJC LH -57 Lens Hood for Nikon AF-S NIKKOR 55-300mm f / 4.5-5.6G ED VR zoom lens developed . Lens hoods are primarily designed to prevent unwanted stray light from entering the lens by extending and shading the end of the lens to prevent. JJC LH -57 lens hood has a non-glare matte surface on the inner surface to further prevent or limit lens flare. in addition, since the end of the lens is extended , you will also have the added benefit of some extra protection from accidental impact . This hood takes a snap-on design, it binds to the lens easily and will not scratch your valuable lens. the hood is also reversible to the lens when not in use remain. now that's original Nikon lens cap can be on the lens normally be attached. 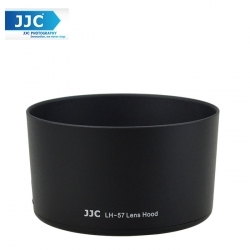 JJC LH -57 Lens hood replaces Nikon HB -57 Lens hood.